B U B B L E G A R M: THROB! Wow, the red lipstick is amazing, it makes your lips look so pin-up!!! Is it particularly different from MAC Lady Bug?? And I personally like that matte nail polish, it has a very beautiful effect! Absolutely stunning! The whole new collection is gorgeous! I'm totally in love with that lipstick, and the Rimmel lip pencil is SUCH a perfect match! I'm even more tempted to pick up the Throb collection now. 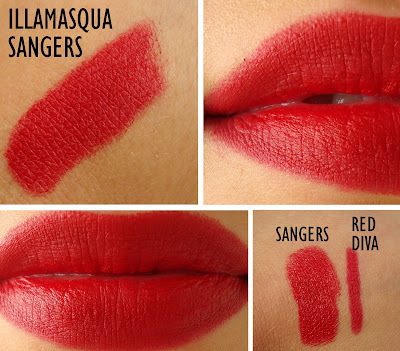 i am yet to find a perfect red matte lipstick this looks like the one im lookking for! gorgeous! This red lipstick looks amazing!!! Damn that red is amazing, classic bright red! oh goodness, can that red lippie get any more gorgeous? Ohhhh, I love it! I can never have enough red lipsticks :) Guess I need to make a trip to Sephora soon! Love the red lipstick! Nice bloody red! Such a pretty red lipstick. I love red lips on other people but I myself am often scared to wear red. L'Oreal Color Riche has a great red color that's creamy and moisturizing. your blog is stunning!! so i nominated you for the style blogger award! visit here: http://insidelook19.blogspot.com/2011/01/some-very-exciting-news.html to receive it! wow the lipstick is intense!! I love it tho, Its one of those colours i wish would suit me but never does!! love the lipstick AND your blog! i'm new to blogging, check mines out? LOVE the red lipstick and the black nail polish! Oh, this must be the most *perfect* red. That's the perfect red lip for me, vibrant and matte!